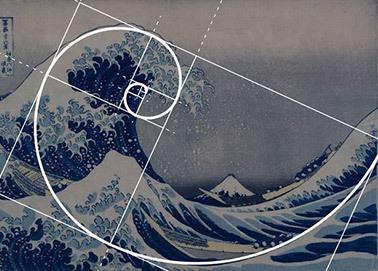 Is it possible to explain harmony with mathematics? Are geometric shapes found in music? Can it be said that music, like mathematics, could serve as a scientific tool? During the concert The Mathematics of Music we will discuss these issues and equip young people with resources for further exploration, drawing on works by Strauss, Rameau, Mahler, Bach, Saint-Saëns, Bartók, and also Goulet. Let us discover together how mathematics and music are related, and how they go hand in hand at the OSM! Music is the art of playing with sounds! At the physical level, sounds correspond to waves that are themselves the result of vibrations: the vibration of a string, of air in a pipe, and so on. The vibration produces a disturbance in the air (the wave), which then spreads in exactly the same way as when we throw a pebble into the river. The air molecules are “jostled” and move about, collide with one another and then, once the wave has passed, each air particle resumes a state of rest—the position it had before the wave disrupted it. These minuscule movements of particles bumping into one another result in changes in air pressure: and thus, sound is born. Even if musical sounds form complex waves that are not perfectly sinusoidal, a few basic notions of physics make it possible to describe musical sounds. 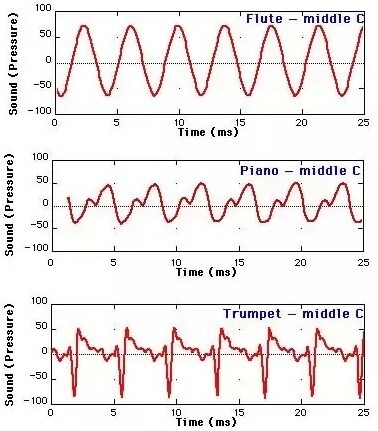 The pitch of the note (low or high) is linked to the frequency of the sound wave, that is, to the number of periods (or crests) that the wave travels through in one second. This frequency is expressed in Hertz (Hz). A high sound has a great frequency: the crests of the wave are close together. The height of the crest of a wave is called amplitude; it corresponds to sound volume, which is expressed in decibels (Db): the higher the crest of the wave, the greater the amplitude of the wave, the higher the volume. Sound is a wave characterized by a given amplitude and frequency, and consequently, a shape: the timbre. In the example below, the same note played by three different instruments shows a similar amplitude and frequency, while the shapes of the periods differ. In antiquity, Pythagoras succeeded in calculating mathematically the sound ratios of the most harmonious musical intervals. The interval separating two notes is measured by calculating the ratio between the frequencies characterizing the higher note and the lower note. For example, the octave is the interval separating two notes of the same name (lower C and higher C). The ratio between the two octave notes is 2:1, meaning the frequency of the higher note is double that of the lower. For example, middle C has a frequency of 264 Hz and the C above middle C of 528 Hz, that being the frequency of middle C multiplied by 2. The fifth, which has a mathematical ratio of 3:2, is the most consonant (or pleasant) interval after the octave. It is the mathematical ratio, for example, between the frequencies of middle C (264 Hz) and the G above middle C, that G being 3/2 middle C, or 396 Hz. The Toccata and Fugue in D minor by the great German composer Johann Sebastian Bach is certainly the world’s best-known piece for organ. It was composed between 1703 and 1707 and illustrates in a remarkable manner how the art of music writing can be explained by mathematics. The fugue is a musical composition in which one or two themes are repeated by successively entering voices. The notions of geometry most often presented in the fugue are translation (a musical sequence is reproduced a number of times, with shifts in time or in pitch) and symmetry (a sequence is played backward, or a sequence is produced with an exchange of the ascending and descending intervals). Their use testifies to the genius of composers like J. S. Bach, because the interval ratios between notes must always be respected to produce harmony. Other great classical composers used mathematical procedures. Fibonacci’s arithmetic sequence is obtained by adding to each consecutive number its immediate predecessor in the series: 0 + 1 = 1, 1 + 1 = 2, 2 + 1 = 3, 3 + 2 = 5, etc., which gives 0, 1, 1, 2, 3, 5, 8, 13, 21, 34, 55, 89 and so on. 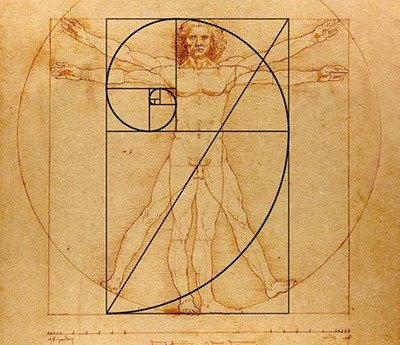 The more we advance in the series, the closer we get to the golden ratio, by dividing any number by its successor. The composer Bartók was fascinated by mathematics and the shapes that are found in nature, such as the spirals in snail shells or the scales of a pine cone. 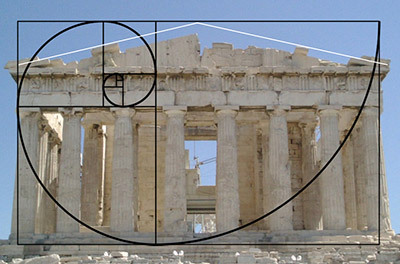 These two examples are forms of natural architecture illustrating one of the most ancient numerical rules, which has come to be known as the golden ratio. According to this ratio, a unit is divided into two parts in such a way that the ratio of the largest part to the entire unit is the same as the ratio of the smallest part to the largest. Bartók used these proportions to determine the relative durations of the different sections of his works. The motto of the Olympic Games —“Faster, higher, stronger”—lends this short and energetic orchestral overture its title. The work was written by Quebec composer Maxime Goulet in 2008, and is characterized by rapid, agitated textures (citius—fast), various ascending melodic movements (altius—high) and powerful chords played in the brass (fortius—strong). It is the ideal piece for illustrating the impact of music on our bodies. It’s no surprise that we like to listen to music while indulging in athletic activity: music stimulates and encourages physical effort because it “lights up” literally all the areas of our brain, and not simply the hearing part (which corresponds to the region of the brain responsible for interpreting sounds). Moreover, a team of Quebec researchers recently discovered that when we listen to music that we like, our brain releases dopamine. This is a molecule associated notably with pleasure, and which gives us a true hormonal “shot in the arm.” Even when we’re at rest, emotions induced by music are reflected in physical reactions like shivers up and down the spine, goose bumps, increased heartbeat, or blinking of the eyes, which are an indicator of a person’s degree of anxiety. When we listen to unpleasant music, the blinking is more intense, more rapid and more frequent than it is with enjoyable music. 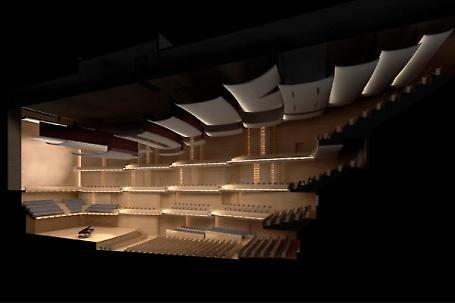 The acoustics of the Maison symphonique are the result of painstaking engineering and acoustical work. The hall is enveloped in a structural shell that insulates it from all external noises and vibrations. The hall’s pillars rest on cushions, and it is upholstered with 175 smaller cushions that bolster the sound insulation. Inside the building, all potential sources of noise like heating systems, escalators or even the toilets have been designed to prevent the spread of sound. The beech wood that covers the walls meets the stringent acoustic demands. Moreover, the auditorium is equipped with mobile ceiling panels permitting geometric modifications of the venue whenever the need is felt. That mechanism makes it possible to tailor the acoustics to the type of event being presented, or even to musical genres: adjustment of reverberation levels, for example, allows for the creation of more intimate or more majestic ambiances. The Grand Orgue Pierre-Béique, so named as a tribute to the founder and first general manager of the OSM (from 1939–1970), is an ultra-sophisticated instrument capable of expressing an exceptionally rich palette of tones, ranging from the virtually inaudible to a very great power that engulfs the entire orchestra. In terms of technological complexity, this is a true sound chameleon. With its four keyboards, 109 registers, 83 stops, 116 ranks and a total of 6,489 pipes is equal in complexity to a computer. The organ can be activated from two separate consoles, which contain the keyboards, pedals, and other elements used by the organist. The first console is fixed in place and mechanical. It is attached to the base of the instrument. The second is electronic and mobile: it can be placed within the orchestra, because an electric system makes it possible to actuate remotely all the organ’s controls and mechanisms. Construction and installation of this great instrument by the organ-building firm of Casavant Frères required over two and half years of work. At 12 metres wide, 15 metres high and 5 metres deep, it weighs 35 tons and is one of the world’s largest mechanical action organs. French composer Camille Saint-Saëns’s Symphony No. 3 in C minor was written between 1885 and 1886. As is the case with every symphony, this is a work that relies on all the instruments of the orchestra, but the presence of the organ lends it a particular colour. Focus on it during the concert: sometimes the tones of the organ blend perfectly with the orchestra; sometimes it stands out very clearly. Chose one composer from the concert programme and investigate the scientific context of the era in which he lived. Example: what great inventions came about in Bach’s time or in Maxime Goulet’s time? Can you recall the name of the first music harmony theorist, of whom we heard a work during the concert? What are the three characteristics of sound?